The line wasn’t actually for women who were lazy, of course: It was just a down-to-earth catchphrase that neatly capitalized upon the spate of guides for Idiots and Dummies, seeming downright solicitous compared to those titles. The main effect the series had was that it made the terminology caught on: Everywhere from Cosmo to Seventeen to Refinery 29 to Prevention (which is geared toward women over 35, though lazy women just doesn’t have the same ring, does it?) has run guides for the lazy girl, usually focusing on fitness or beauty. 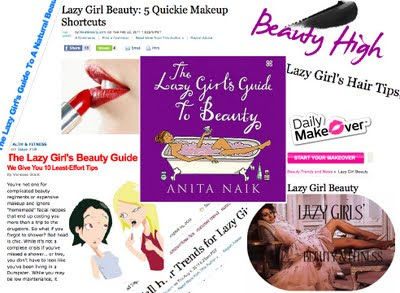 The term “lazy girl” reveals less about the low-effort shortcuts that are promised and more about what it implies about all the rest of the beauty advice we’re given. While we sometimes use lazy to mean leisurely (a lazy Sunday afternoon), most of the time when we use lazy—especially in work-obsessed America—we’re using it as a slur. When we giddily tout the guide for the lazy girl, it may seem liberating, but in actuality it’s an admonishment: We’ll let you get away with it this time, the lazy girl’s guide tells its readers. But don’t think you can get used to this. Sometimes the advice really can be applied to the lazy—sleep with your hair in a bun so you wake up with no-labor waves; wear bright colors to distract from your less-made-up face. But much of the time the advice is downright industrious. At best, it’s about skipping beauty labor that, under other conditions, we’re assumed to perform. “I don’t curl my eyelashes,” confesses the Refinery 29 writer; “Use an illuminating cream-colored shadow on your eyelids, inner corner of the eye and under the brow to make your eyes look wide awake," writes Daily Makeover—the presumption being that this is a shortcut from our normal eyeshadow routine. At worst, it’s about encouraging us to buy more products, with an accompanying convoluted justification of how it actually saves us labor: We can spray our feet with callous softening spray for when we give ourselves pedicures; we can buy an ionic hair dryer; we can do at-home highlights (the idea being that we’re “too lazy to hit the salon,” as though laziness is what's preventing most women from getting professional hair color). Now, don’t get me wrong: I’ve got nothing against a good beauty tip, and I’ve definitely got nothing against laziness, of which I have a long, mighty history. (ase in point: At age eight I announced to my family that I was dropping the first letter of parenthetical clauses that began with the letter “C” in order to save myself the effort. AND I STAND BY IT.) In fact, the very reason the spate of lazy girl tips jumped out at me is because it's the type of beauty story I'm most likely to read—in theory, it's geared specifically toward women like me, whose beauty routines are performed with a sort of no-nonsense attitude, not a mind-set of fantasy and play, and who thus are probably looking for a break here and there. 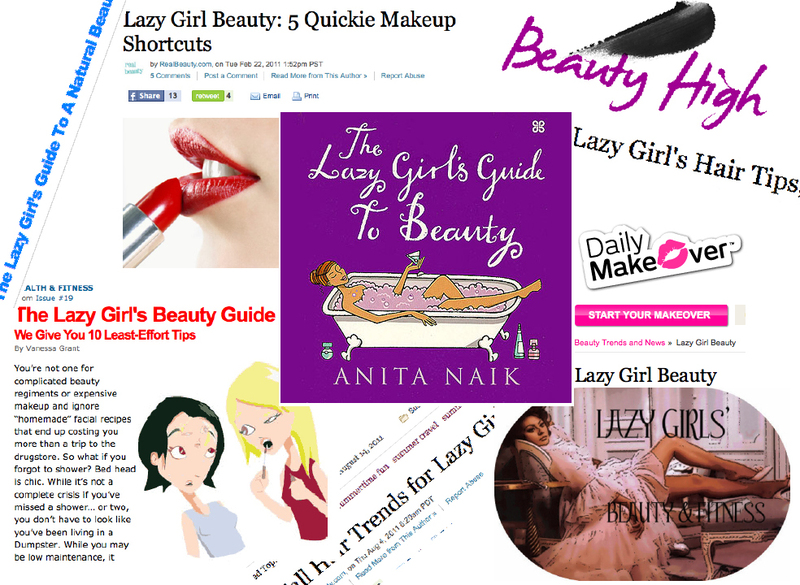 And I actually appreciate the irreverence of the lazy girl’s guide over the sacrosanct attitude some beauty copy has. I just don’t like the idea that by being minimal, I’m being lazy, as though not applying eyeshadow is in the same category as playing dumb when it comes time to tally up the restaurant bill (I’ll always pay my share, but please for the love of God don’t make me do the math, too many mai tais!) or calling a coworker to pick up a file instead of delivering it myself. I’m actively choosing “lazy” tips because I’m the opposite of lazy—I’m busy. My beauty labor is indeed labor, and I treat it as such—but the mere act of performing it is a sign I’m not lazy about it at all. What an interesting topic! Lazy girl makeup rather rivals the "natural" makeup girl, which in fact requires probably 15 different products and at least thirty minutes of effort (lol). I think anything women can learn to make their lives easier is a good thing. There was one time about 4 years ago, when a coworker commented on my not-so-shaven legs. (I was wearing a long skirt that had sort of slid up to reveal my lower calf.) I do believe it was intended in a kind "sharing a moment, girl-bonding" sort of way. She sort of laughed and said, "Yup, that's why I'm wearing pants. Sometimes I'm lazy and let it go too long too." Now, it's true that I prefer my legs to be fuzzy when I can get away with it professionally. And it's true that sometimes I am lazy. But the one is not evidence of the other. I rather liked the phrase "laziness is the mother of all invention". It wasn't until someone at work pointed out it was giving the wrong impression of me shirking at work. I was actually using the resources available to do things more efficiently, working smarter not harder. Laziness gets a bit of bad press. I suppose I have a rather zen attitude about all this. I believe that ultimately Mother Nature knows best and therefore I should follow the path of least resistance, flowing with the river. I love this post! I especially like the last part: "I’m actively choosing “lazy” tips because I’m the opposite of lazy—I’m busy." I feel the same way. Honestly, most women I know who have busy, interesting lives find ways to "skimp" on their beauty routines. We have to. There's only so much time in the world. Tori, ick for your coworker attributing your unshaven legs to your beauty work ethic. It's not like you'd done a week of movie-watching in your classroom instead of actually teaching; you just...didn't take a razor to your legs! Beks, ha! Yes, laziness does get a bit of bad press. I mean, wasn't the first webcam set up by a bunch of computer scientists who didn't want to walk to the breakroom to see if the coffee pot was full? Terri, we need to spread your quote around, because it is absolutely the best "defense" of lazy-girl beauty possible! Hypothesis: Heat can be Air Force Womens Heels directly correlated with water evaporation rates. Methodology: Several cardboard boxes of the same size are constructed, installing a different watt light bulb in each. Eight ounces of water is placed in glass containers in the boxes, exposing the Nike Free 5.0 V3 water to light sources. Eight ounces of water is additionally placed in a glass container in a control box which has no light source. The light bulbs Nike Air Max Thea Print Mens are turned on and the remaining water is measured after 30 hours. The student uses the scientific method to establish that the greater the bulb wattage, the faster the evaporation rate, repeating the experiment four times, documenting and comparing outcomes via written records and photos. Methodology: Three different rats learn to navigate a series of three mazes while influenced by three different auditory factors: rock music, classical music and no music. Each rat is tested in each maze and with a different auditory factor to allow for possible differences in intelligence, hearing and difficulty of the maze. Results are measured and documented, enabling the scientific method to be WMNS Nike Dunk Heels used as a tool to demonstrate the rats learn best in silence with minimal distractions. In middle school, students learn how to conduct science experiments using the scientific method, . Science Nike Free Dynamo Fair Projects: 6th Grade Science Fair. Science fair projects are based on the scientific method. Students formulate a hypothesis and predict the outcome before performing the experiment. Nike Free 5.0 V6 The. The scientific method provides the best platform for creating a successful science fair project. To use the scientific method, you should choose. Sixth Grade Scientific Method Experiments. In middle school, students learn how to conduct science experiments using the scientific method, just like a. Researchers and laymen alike use the scientific method to answer Sneaker Online scientific questions through observation and experiment. This process helps to limit bias.